I have thought about styling, or re-styling, my living room bookshelves for a while. There were a few obstacles though…like where would I put everything that didn’t make the cut? Storage in my house is running out…very quickly it seems. Anyway, my goal was to get all my white and cream ironstone finally in one place. I love seeing bookshelves styled with a homeowner’s collections. I think it’s a great way to put your mark on a room. After the initial confusion, it all started to come together. My living room is a rectangle. One long wall is nothing but window and bookshelves. It was one of the reasons we bought this house. The symmetry of this wall just makes me smile. When I sit in my corner chair, this is the wall that I see. I tried leaving some of the books on the shelves and just adding the ironstone. For me it didn’t work. What I would like to do is cover some of the books with ivory paper and then add them. The hodge podge of my book collection was throwing everything off. I’m working on some new pillow covers to bring in more pops of yellow. I’ve wanted to add some buffalo check for years and finally ordered a swatch from Country Curtains. Hopefully it will be just the right color. I thought about clearing out the corner cabinets in my dining room and putting the ironstone there. I decided against that because I wouldn’t be able to enjoy it. By putting it in the living room, I can not only enjoy the view, I can obsess about adding more! Happy Wednesday…make it a good one! 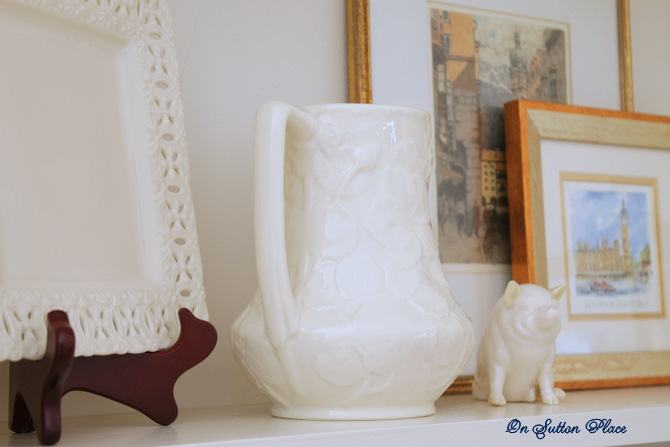 LOOOOOVE all the white and that quirky little pig :) Beautiful job! Symmetry makes me smile, too. I love your ironstone display and I think it’s great that you put it where you can truly enjoy it. I can’t wait to see the buffalo check…..I’ve wanted to incorporate buffalo check in my home for a long time….just haven’t found the right spot yet. Well done with the bookshelves. 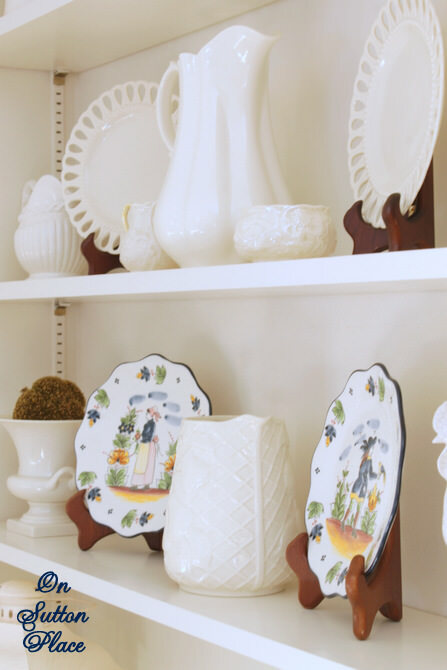 They look great and display your creamware so well. Dd you try turning the books so the spine was facing the wall and all you can see is the pages so there is less colour. 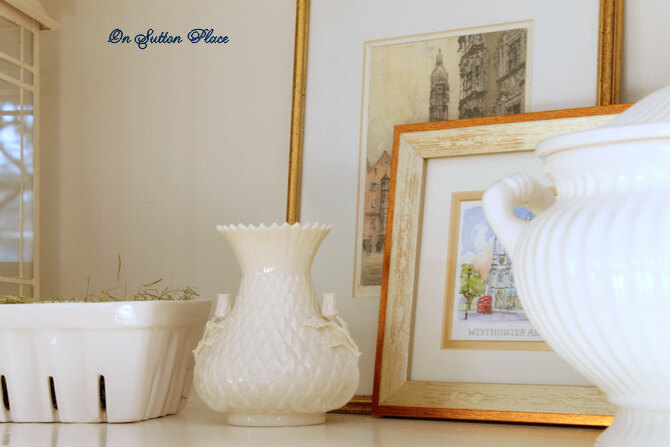 White ironstone is so perfect for you home and your style. Great job Ann! I love ironstone Ann, but I have one small bowl. That’s it. Let’s go ironstone shopping together!! So pretty An! I love the styling and all the white! WOW! So beautiful, Ann! You have me inspired to finally tackle my office bookshelves!! Nice work! I think your collections looks stunning. It is so serene and tranquil, especially after the holidays. Just lovely! Your collection has a perfect home now. I love the idea of covering the books in Ivory, I have wanted to do something similar for years! I love your ironstone collection, you should display some items. Ann, I would put all that lovely ironstone collection on display, too! And how wonderful you’ve “discovered” space to allow your collection to grow. I have been pondering what to put back on some shelves that we have on our big dividers. Hope the buffalo check is just the right color! I like it when collections are displayed in one spot rather than scattered throughout the house. Your shelves look great, and I like the Quimper mixed-in with the white ironstone. I love buffalo checks. I can’t wait to see what you make with it! I think I need you to come and do mine – I’ve had a wall of built-ins put in…still empty because I don’t have a clue what to do with them. Love your ironstone collection…so pretty! I have book shelves in my living room too and have my white pitchers on the shelves with the books. Not really happy with them all being on the shelves together, but I have no where else to put the books. I love buffalo check and have them in the tan color in my living room and dining room. 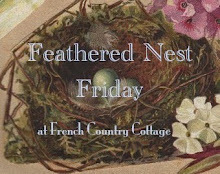 I purchased the fabric from JoAnn’s and made them…but I’m asked all the time if I got them from Country Curtains. Your bookshelves look sooo good. I like your mix of ironstone and pictures. I know what you mean about covering books in white to make the look work. I need to do that, because my bookcases look like a hodge podge of things. You did a beautiful job! I’m off to watch the last part of the first episode of Downton Abbey. I recorded it and just finally settling down to watch it. Love what you have done, and I think it is a brilliant idea to cover all the books with the same ivory paper. I am always fascinated how people “style” their bookshelves. I really like the way you fashioned yours shelves to look clean, and simple but elegant. Your eye rests upon each piece without feeling overwhelmed. Great job Ann! I love the ironstone. I just started my own collection, and I want to display them just like you, all together! I love white dishes displayed together. Yours looks great! I completely understand your new obsession. You’ll have fun adding to your collection now. 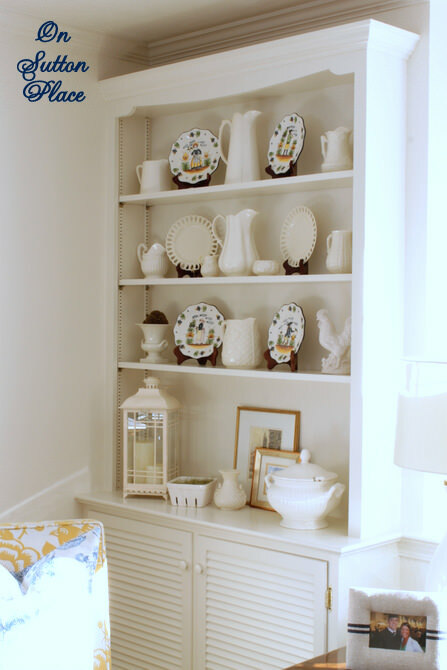 Theses book shelves filled with white and ironstone are lovely. I have a huge wall of shelves and windows filled with books and it is a big ole mess. It looks fabulous Ann! Great job. Hi Ann, I’ve been wanting some of the Country Curtains buffalo check in black. I hope you like the yellow – it looks fabulous in the catalog. Your shelves look wonderful! pretty pics ann! funny we both had posts about new shelving and displaying today!! Looks great Ann, love the white, it’s so clean and fresh sight to enjoy. Nice change to your bookshelves. It’s often a challenge to get shelves looking just right. Very nicely done! Sounds like you are loving checks too! I have purchased a small checked grey Ikea comforter for the end of my bed. The colour of it keeps it from looking too country and I’m going to go from there with a makeover in there. And Ikea has a lovely red and white check, larger but not buffalo check that I want to use in my kitchen. I think I’ll make new window treatments in there. 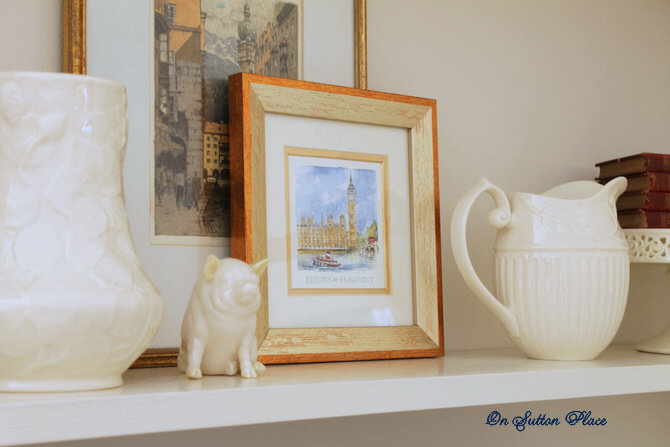 I love your bookshelves with the white ironstone, it’s very beautiful and I appreciate the symmetry that you’ve achieved with what you have on it. Your bookshelves look fabulous Ann!! I love how you layered the pictures and I love your Quimper plates on the other side! 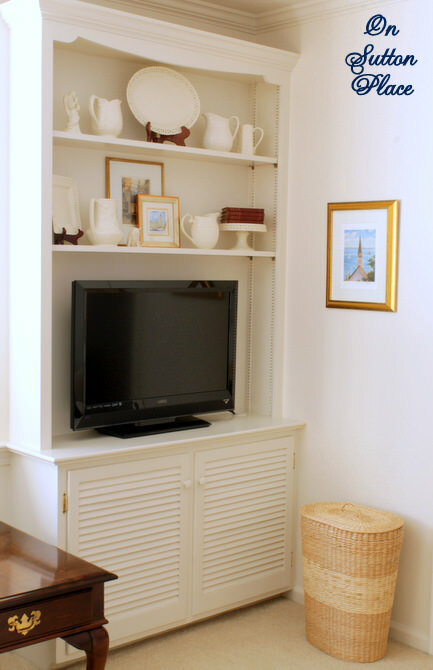 Hi Ann, I love your shelves and your white pieces look lovely! I spy some Quimper too, don’t I? Your shelves do look just perfect. Love all the white and the artwork propped in the back. The colors are soft and pretty. Ann, I love your bookshelves and your ironstone collection. You have a good start on it with some really pretty pieces. Have fun! Love what you have in them now…..love your pottery plates….are they Polish? Your shelves look wonderful Ann! How fun that you can now go hunt for more. I used to have Country Curtains yellow buffalo checked curtains in a home I had two homes ago and loved them. Oh Ann, it looks so beautiful! I agree, it’s far better to have room for more pieces… how fun! The layered art also looks great. 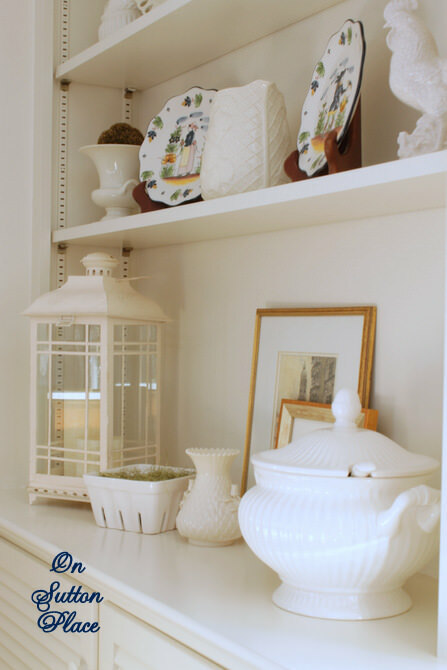 For me anyway, styling shelves is one of the hardest things to do, and yours look fabulous with your ironstone collection! The collection makes a great impact displayed all together! Isn’t it funny how you innately know how you want it to look but it takes a bit to get it to look like your vision? Happens to me all the time! Lovely display! I adore the Dutch plates!